The fire god of Akiba Shrine, located in the village of Ukeji, east of the Sumida River, was very popular among the wives and ladies-in-waiting of the daimyo estates of Edo for protection against fire. Within the shrine grounds are many green pines and vermillion maples, particularly beautiful in the late autumn. In the water reflection the green of the pines becomes yellowish and the red of the maples is softened to a light pink. 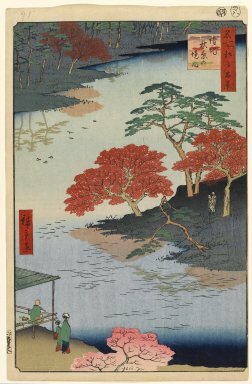 This is the only print in the series in which the brilliant autumn colors are fully enjoyed; the red pigment used here is different from the red lead which blackened in prints 88 and 94. The author has proposed that the figure of the priest seated in the teahouse in the lower left, sketching the autumn foliage, may very well be Hiroshige himself. He became a lay priest in the Third Month of 1856, at the age of sixty, just at the time this series began to appear. In 1882, twenty-five years after the artist's death, a stone memorial was erected here by Hiroshige III, the last in the direct Hiroshige line, which was engraved with the artist's parting verse and a small image of the artist in priest's robes inscribing a poem. The memorial was destroyed in the great earthquake of 1923.